Found in Northern Queensland, Lepidozamia hope is commonly called Hopes Cycad, or simply Zamia Palm. It grows in rainforest areas and wet sclerophyll forests at altitudes to 1000 metres. This is a very tall growing cycad, certainly the tallest in Australia and maybe the tallest of all. Reaching over 20 metres in ideal conditions, it is slow growing. Growing naturally as an understory plant, it thrives on shade and moisture. It will grow in more temperate climates in good conditions, however it will be much slower in cooler climates. Both male and female flower cones are produced, the male cone being cylindrical and the female cone being ovoid in shape. When the seed sets it is bright red and is toxic. 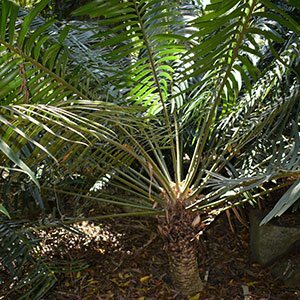 This Giant of a Cycad can be grown in a container, however as it sends out a large tap root it will need to have a large deep container to survive. Propagation is from seed and growth rate is slow. Lepidozamia hopei or Hopes Cycad is available for sale from the following nurseries.